This structure tells us about the type of home a prosperous Detroit industrial leader built for his family in the earliest decades of the city's development as a manufacturing center. Lee Burt had this two-story Italianate home with its hip roof built in the early 1870s. Originally, this was a frame structure, but the brick exterior was added between 1885 and 1888. The geological surveyor, William Burt, along with Dr. Douglas Houghton, discovered iron ore in Marquette County, Michigan in 1844—an important discovery that helped to make the nation's Midwest into the industrial capital of the world a few decades later. William Burt and his son established manufacturing firms in Detroit, utilizing the iron they discovered. In 1868, the Burt Manufacturing Company was established to make wheels for railroad cars and iron based paints with Lee Burt as superintendent. By 1872, the firm manufactured iron castings, architectural ironwork and iron fronts for buildings. In 1880, Lee Burt became manager of a successor firm, Detroit Iron Furnace. This firm survived into the automobile age and was sold to U. S Rubber just before World War I. U. S. Rubber erected a huge tire plant at East Jefferson and the Belle Isle Bridge. This factory has been torn down and the now vacant area will be developed into a park. U. S. Rubber used the Lee Burt home as a dormitory for workers for some years and then, in 1935, the United Rubber Workers bought the property for their recreational association. 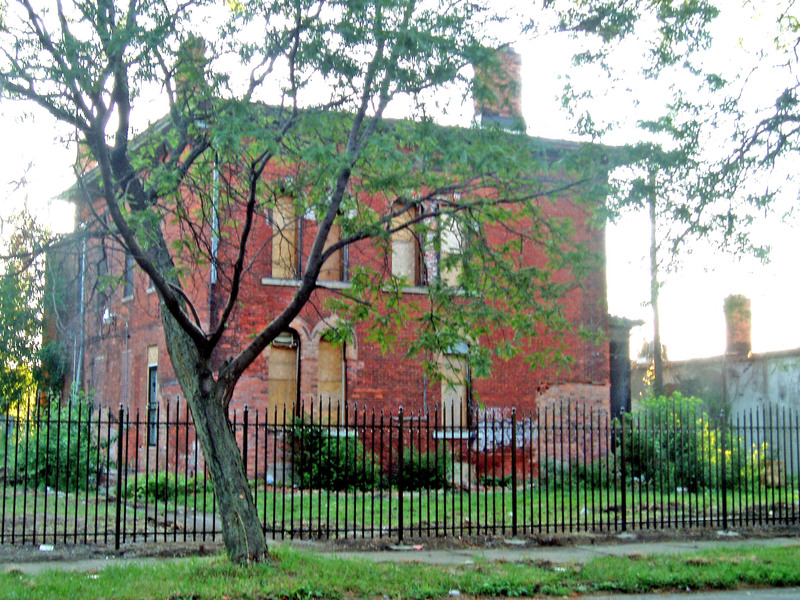 The rubber plant closed in the early 1980s and the Lee Burt home was, apparently, abandoned. The attractiveness of this once beautiful home was compromised when unappealing commercial structures were built in front along East Jefferson. If you look at the home carefully, you can see the attention the architect devoted to the gracefully arched windows. You will also note a period chimney. City of Detroit Historical Register: Listed October 25, 1985. This has also been designated by the city as a Local Historic District. Use in 2003: This is a derelict, abandoned building in great disrepair and surrounded by barbed wire. Nevertheless, this home is listed with the city, state and federal historic registered because of its significance.